Wondering how to compliment a girl read this amazing guide here and get girls to like you, fall in love with you and sleep with you. First of compliments are the most common way of expressing your interest in and attraction to a girl? Unfortunately, their overuse is rampant, and has made many people wary of flatterers using compliments to get their way. There's an unspoken formula for the number of compliments you give. Anyone can give one or two compliments in passing, and it doesn't necessarily have to “mean” anything. But three or more compliments in one conversation is a fairly reliable sign of attraction and interest – and the type of compliments you give signifies your level of interest, too in a woman. Men don't take compliments the same way women do. Women don't take compliments the same way men do. John Gray, author of Mars and Venus On a Date, argues that the way to master compliments for each gender is to “acknowledge men and adore women” (202). According to Gray, men and women respond best to different types of compliments. So, for example, on a date that featured a movie, dinner, and a beautiful sunset stroll along the beach, the type of compliment the man would prefer to receive would be one that compliments him indirectly. So, if his date was to say something like, “Wow, what a perfect evening. That movie was great, and the sunset is incredibly beautiful. I'm so glad we did this together,” the man would feel really appreciated and emotionally connected with. Gray theorizes that this is because men tend to take pride in the things that they can do and provide for their partners. So, even though the man wasn't personally responsible for the beauty of the sunset or the humor of the movie, he would still feel as though he was, and would really appreciate a compliment that indirectly acknowledged his role in orchestrating the evening. On the other hand, women, says Gray, really thrive on personal, direct compliments. Women like to be complimented on specific and personal features. It makes them feel singled out and appreciated for their own, individual charms. An example of a successful compliment for a woman, according to Gray's theory, might be something along the lines of, “You look incredibly beautiful tonight. The first example is still a perfectly functional compliment, to be sure, but women feel reassured and much more certain that their partner finds them irresistible and attractive when the compliments are really, truly personalized. All you have to do to personalize a compliment is make the woman the active subject of the sentence. This sounds a lot more confusing than it actually is. Here are some examples to illustrate what I mean. So let's say you've given a great compliment. It's appropriate to your date's gender, and it appears to have pleased her. What do you do next to prevent the compliment from just hanging there, awkwardly, in the air, paralyzing all other conversation and making your date blush and scramble for words? You serve up a great compliment – one that's guaranteed to give your date the warm fuzzies – but after you've dished it out, everything kind of .... freezes. They acknowledge the compliment with an embarrassed, modest little “thank you,” and then ... nothing. You hit a wall. There's a dead silence. Someone has to introduce a new topic of conversation, stat! To prevent this ugly little scenario from enacting itself, all you have to do after every compliment you give is ask a question. This solves all the potential problems that compliment-giving can introduce to an otherwise-healthy conversation. Complimenting by asking a question is a great way of preventing death-by praise from striking your conversation and leaving it for dead. So tailor your compliments to your date. Men like to be acknowledged for providing such a good time/fine food/beautiful surroundings, etc., while women prefer to be complimented directly on personal traits and features. Always package your compliments with a question, to keep the conversation moving along! But what if it's the other way round? What if you're the complimentee, and the complimenter doesn't know the rules? What if they've just made an effort to say something nice to you, but they've never heard of the “compliment/ question” equation? Well, you can take control of the situation yourself; it doesn't all hang on the complimenter! First of all, let's just make sure you're aware of the most basic etiquette of accepting a compliment. Some – in fact, many – people, upon receiving a compliment, seem almost paralyzed by it. They feel as though to verbally acknowledge the fact that they've just received a compliment would be big-headed – rude, almost. So they say nothing, or give an embarrassed little nod (eyes averted) to acknowledge the compliment. News flash! It's not called “accepting a compliment” for nothing. Acceptance implies a certain degree of active acknowledgement, wouldn't you say? If someone goes to the effort of paying you a compliment, they want to enjoy the effect it has on you. They want to see the warm feelings engendered by their compliment engulf you. It's a big part of the rush of complimenting someone: you want to make them feel good! If you don't respond adequately to their compliment, you're depriving them of that rush – and, to be honest, yourself of one, too. Acknowledging a compliment enables you to savor it fully. Make sure you always thank someone for complimenting you. Never just let it slide and assume that it would be conceited of you to allude to the compliment. Don't assume that nobody will notice if you don't thank them, either. The person who complimented you certainly will – and if there's anybody else present, they'll notice too! But to say nothing but, “Thank you,” is the verbal equivalent of a cold limp fish. What on earth are you supposed to do with it? It just ... flops there. Inescapable, confusing, and more noxious by the second. So package up your, “Thank you,” with a return compliment. Nothing too major, because that would be the height of insincerity. For example, if they tell you you're wearing a great outfit, definitely do not try to return the compliment by commenting positively on theirs! Do you see what I mean? Nothing too showy or blatantly brown-nosey: just a simple, clear message of appreciation that lets the complimenter know and enjoy the degree of pleasure that their compliment has given you. I will stop here. 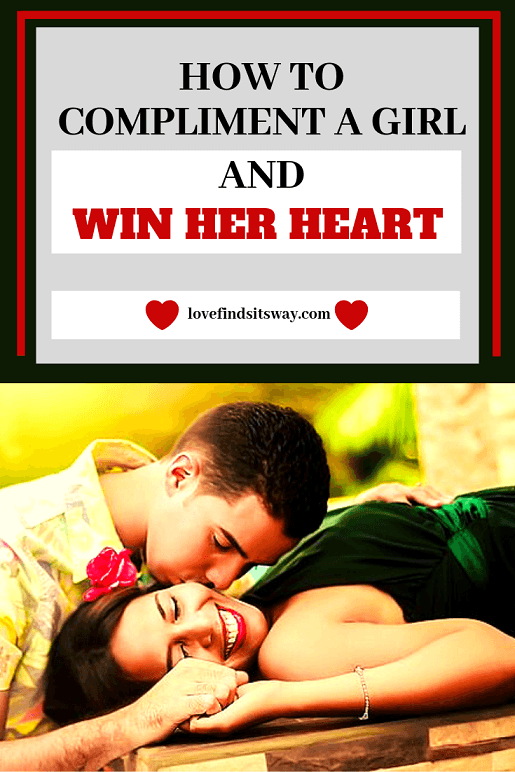 If you loved reading this guide on how to compliment a girl and win her heart you'll also love this powerful video presentation.